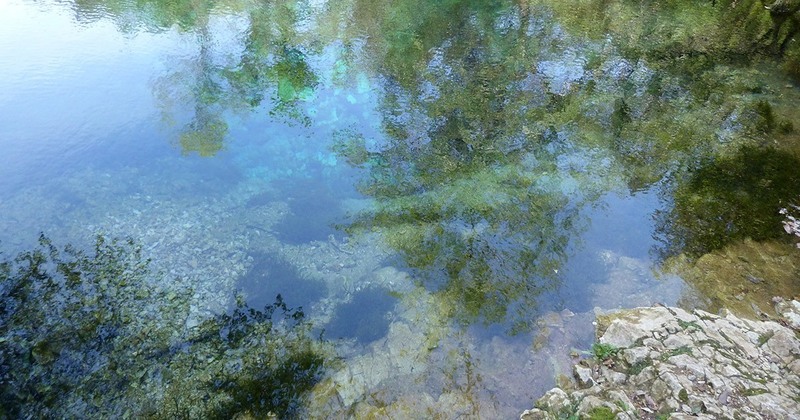 The resurgence of Font Vive in the Ardeche is a natural site that is located in the vicinity of Grospierres about 2 km from the village, in the Department of Ardèche in the region Rhône-Alpes Auvergne. This place made part of routes not to be missed if one carries out tourism in this area. It is also a quiet and relaxing area for those who need to get away completely. As it is very quiet, you can do yoga or meditation. We will not be bothered there. In addition, nature and everything that constitutes the environment around form a landscape and a perfect. This resurgence of Font de Vive is promisses. Here the siphon leads in a natural pool that is exceptional. It is located at the foot of the ruins of the Chastelas. She has a depth varying between 9 and 10 meters. Its clear water and the green oasis that surrounds are a true panorama worthy of a picture of a great painter. It is possible to visit this place daily. This place has been explored for the first time by Bob Destreille in 1974. Since then, visitors who have reached this unique site has multiplied. It has even become one of the must-see destinations in the area. How to reach this site? If we start from Ruoms, must follow the direction of the Vans by the D111. We must then get the crossing of road which is close to the tourist center of the Lincoln. There is a barrier that stops the car trip. The rest of the way must be done on foot. Since the hiking info point, we have to follow a grassy path that changes in trail. Several meters of market, after by a dolmen and Combe of good girl. Then there is red tags that lead to our Lady of dreams. There is a small chapel nestled in a setting of Green Oaks. We take the other direction which leads to the Font Vive junction. From this place, we have to follow the trail on the left. The path leading to the resurgence is stony. In total, it takes about 3 hours to reach this site. The elevation is 350 meters. The total course is 8 km away. It is possible to do this route with your family, friends or lovers. But as one must pass through difficult trails, the ideal is to go with strong enough children. Do not forget to bring snacks and water. At the market, we can find quiet corners to relax and regain strength. We suggest also to tourists and holidaymakers who decide to visit this site to go with a guide or a guide who knows the place. In this way, we will not miss important routes. There is no risk of getting lost on the way.